Con/ Sound and wearable; missing reverse enclosure, cleaned and waxed. Description/ Christ, nimbate, standing facing, raising both hands in benediction, flanked by Saints? at each compass point. 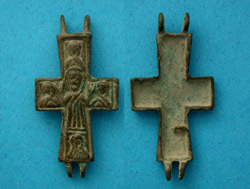 Seller's Note/ Engolpions contained relics of deceased saints - a lock of hair for example, fragments of clothing or some other items that belonged to a saint. 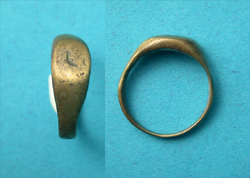 More common is a cross that contains an item that was at some time handled by a particular holy person (the pope, for example), or just about anything tangible that has had deep religious significance.